The Library currently is providing trial access to the Chronicle of Higher Education. Accessible on any device, this subscription would allow you full access on or off-campus. If you would like to provide feedback, please do so in the comments below or email Dean Suzy Szasz Palmer. The Library understands you may want the fastest and most direct way to find and access the resources you need for your coursework. 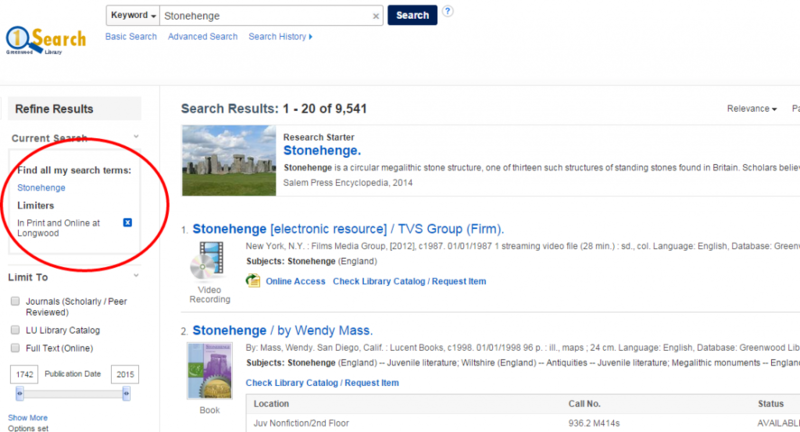 With the start of Spring semester 2015, we have introduced a new feature in the Library’s OneSearch portal. In the upper left of the results page when searching in OneSearch, you’ll notice the header Refine Results, and beneath that, Current Search. Under Current Search, now you will find the default limiter, “In Print and Online at Longwood.” This automatically directs the search service to retrieve only the records for material which is directly available for your use, whether physically or electronically – ignoring all listings in databases for materials which are not either owned by the Library or available through Library resources. This limiter can also be removed if you wish to search more broadly; clicking the white-on-blue “X” to the right of “In Print and Online at Longwood” disables the limiter, enabling the retrieval of citations and abstracts for un-owned materials, for which you may place Interlibrary Loan Requests (by clicking on the “Request through interlibrary loan” link in blue text beneath each result’s brief record). Closing your search page and restarting another search will re-enable the “In Print and Online at Longwood” limiter if you again wish to limit your search results. Greenwood Library is pleased to make available to the Longwood community a unique database from World Trade Press. “A to Z” is a survey of world nations and their cultures, with an added emphasis on business culture within different nations. Each country’s profile provides detailed coverage of more than 100 topics each, including the nation’s culture, currency, economy, food, greetings, holidays, human rights, language, stereotypes, weather, and much more. You can access it from within Databases A – Z (which is linked from the library’s homepage), or directly here (requires Lancernet ID and password for off-campus access). 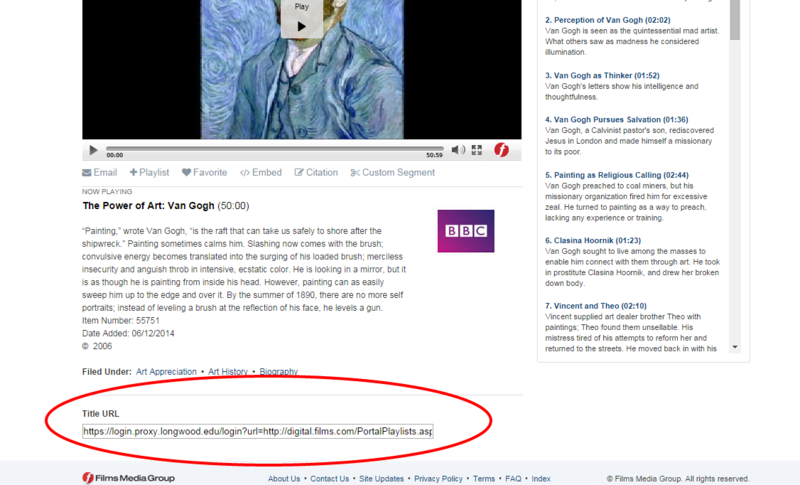 For faculty linking to or embedding video from the Films on Demand database: the URLs will be changing this week and you will need to update your links. While the old URLs will still work, they direct users to a general index page from which they must browse to the desired title. To include a link, find the video or clip you wish from the database and scroll to the bottom of the page. Select the URL and place that link in Canvas. As always, if you need help, please don’t hesitate to ask us! This year, the Library has acquired several new databases that will help the Library support the QEP as they will significantly enhance student research, as well as support faculty scholarship. A digital library of over 1.6 million digital images in the arts, architecture, humanities, and sciences with an accessible suite of software tools for teaching and research. Includes contributions from outstanding international museums, photographers, libraries, scholars, photo archives, and artists and artists’ estates. Collections are used for teaching and study in a wide range of subject areas, including art, architecture, music, religion, anthropology, literature, world history, American Studies, Asian Studies, Classical Studies, Medieval Studies, Renaissance Studies, and more. Consists of every significant English-language and foreign-language title printed in the United Kingdom during the 18th century, along with thousands of important works from the Americas. From books and directories, bibles and sheet music, to sermons and pamphlets, Eighteenth Century Collections Online features a variety of materials to provide a critical tool for both faculty research and classroom use. The collection contains more than 26 million pages of text from more than 136,000 titles, fully searchable online, that provide critical information in the fields of history, literature, religion, law, fine arts, science and more. The original source material is primarily from the British Library, as well as Oxford University, Harvard University, Cambridge University, National Library of Scotland, National Library of Ireland, the Library of Congress. Provides a searchable database for the backfiles of hundreds of full text journals across a wide variety of disciplines. With this latest component of the Arts & Sciences section, Greenwood Library has a complete JSTOR A&S collection. This is an upgrade to our Library, Information Science & Technology Abstracts with Full Text database with full text to more than 440 journals and 30 monographs, as well as additional indexing for hundreds of high-quality journals, as well as books, research reports and proceedings. Coverage dates back to 1900, providing both historical and current research information for library and information science. As the “world’s newspaper of record,” The Times of London has covered all major international events from the French Revolution to the War in Iraq. The Times Digital Archive, 1785–2007 makes over 200 years of this resource available for students and researchers of 19th-, 20th-, and early 21st-century history, literature, culture, business, art and architecture, and more. Every complete page of every issue is full-text searchable — every headline, article, editorial, announcement, image and advertisement. The digitized archives of the National Association for the Advancement of Colored People (NAACP), one of the most famous chronicles of the civil rights movement, includes nearly 2 million pages of internal memos, legal briefings and direct action summaries from the association’s national, legal and branch offices throughout the United States. With a timeline that spans 1909 to 1972, users can examine the realities of segregation in the early 20th century, chart victories such as the passage of the Civil Rights Act of 1964 and the Voting Rights Act of 1965, then explore the late 1960s and 1970s as the Black Power Movement, urban riots, and the Vietnam War provided challenges for the NAACP. Legal files in the collection chart the organization’s spectacular legal successes from the 1910s through the 1954 landmark Brown v. Board of Education decision and into the early 1970s. The Norfolk Journal and Guide evolved from a fraternal order publication known as The Lodge Journal and Guide to become one of the leading black southern newspapers. When P.B. Young Sr. purchased it in 1910, it was a four-page weekly with a circulation of 500. By the mid-1940s it had been expanded to 32 pages and had a circulation of over 80,000. This repository for ready-to-use tests and measures from the American Psychological Association features instruments that are relevant to psychology and related fields, such as psychiatry, education, medicine, business, social work and more. International in scope, this resource provides access to thousands of actual test instruments, most of which are available for immediate download and use in teaching and research. PsycTESTS is an authoritative source of structured information about tests of interest to a variety of fields, and while focused on contemporary instances of test use, has coverage that spans more than a century. Provides access to over 70 Virginia newspapers from as early as 1750 to as late as 1880. Date ranges for each title vary. Includes the Richmond Times Dispatch from 1903-1986. Richmond Times Dispatch, a companion database, provides online access from 1985 to the present. The largest single collection of English news media from these two centuries, providing rare and often unique content for scholarly research into a wide range of political, educational, economic or journalistic study. Approximately 700 bound volumes of newspapers and news pamphlets were published mostly in London, but also include some English provincial, Irish and Scottish papers, and a few examples from the American colonies, Europe and India. This digital collection, made possible by a partnership with the British Library, puts these early newspapers into the hands of scholars and researchers and is an invaluable research tool for all disciplines. Especially exciting for those faculty and students in the Cook-Cole College of Arts & Sciences department, we are excited to offer a trial of ARTstor until April 20th 2014. Please try it out and give us your feedback! 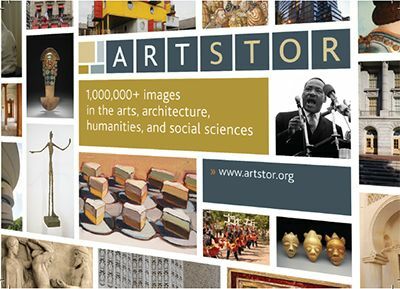 ARTstor is a digital library of more than one million images in the arts, architecture, humanities, and social sciences. While we have the trial, you are encouraged to register for an account so you can access the digital library from off-site, create and save image groups and add personal notes. To register, click the “Register” link in the “Welcome to Artstor” box in the upper right corner of the Digital Library. A user must provide an email address and password of their choice. Several databases will be down for maintenance March 1st and 2nd; users may experience slow connections or be unable to connect at all during this time. We apologize for any inconvenience this may cause. If you need help, please feel free to contact us and someone will get back to you in one or two business days. 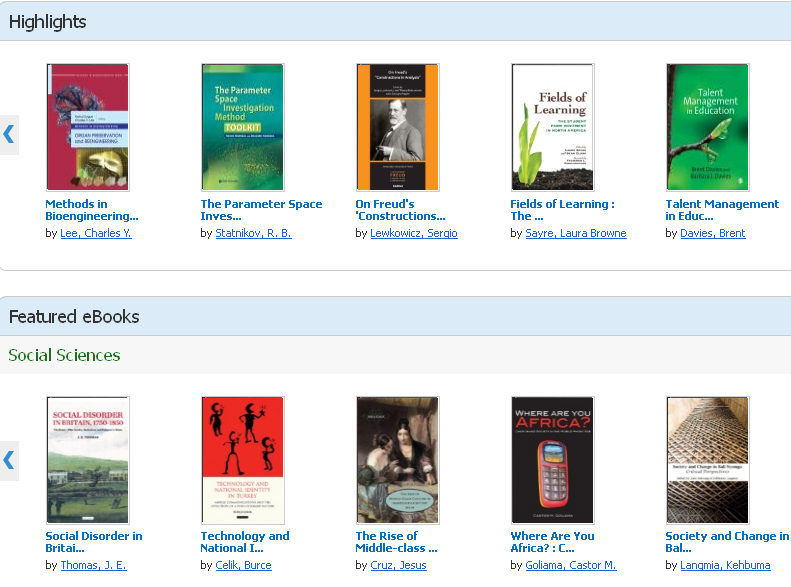 Journey into the Past with 3 New Library Databases! Would you be interested in your students learning what the life was like in the United Kingdom in the 17th-18th century? Try this new database, 17th & 18th Century Burney Collection Newspapers, that contains a full-text, fully searchable digital archive of nearly 1,270 newspapers and news pamphlets from the United Kingdom. Collected by the Reverend Charles Burney, this unique collection represents the largest single archive of 17th and 18th century news media available from the British Library. Would you like your students to experience the essence of the Enlightenment period in Great Britain? Check this new database, Eighteenth Century Collections Online, that features books and directories, bibles and sheet music, sermons and pamphlets published in the United Kingdom during the 18th century. Would you like your students to bear witness to major international events from the French Revolution to the War in Iraq from the “world’s newspaper of record,” The Times of London? Try out the Times Digital Archive, that captures 19th-, 20th-, and early 21st-century events and accomplishments from the Times (London) perspective. 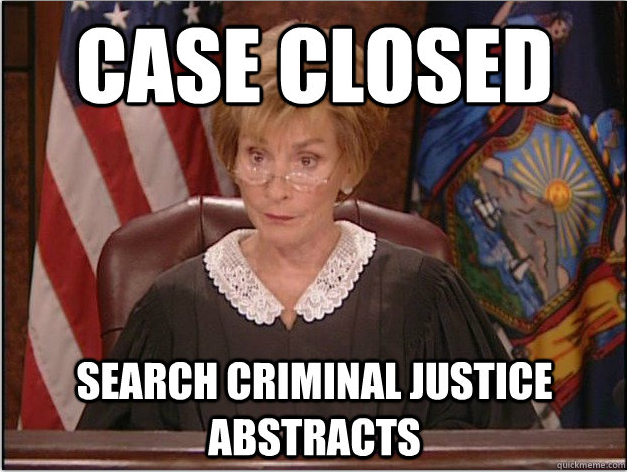 If you are looking for information on crime trends, juvenile delinquency, courts or any other criminal justice topic go to Criminal Justice Abstracts with Full Text, which you can locate from the library’s home page>databases a-z. Give it a try and let us know what you think! Homepage slider image from Boston Public Library | CC licensed.